February 18th, 2019 - Does My Bomb Look Big In This? Last night there was a festive air to Norton Street that reminded me of its long past heyday. As we made our way down from the jersey caramel-toned Leichhardt Town Hall, every restaurant was operating at close to full capacity. 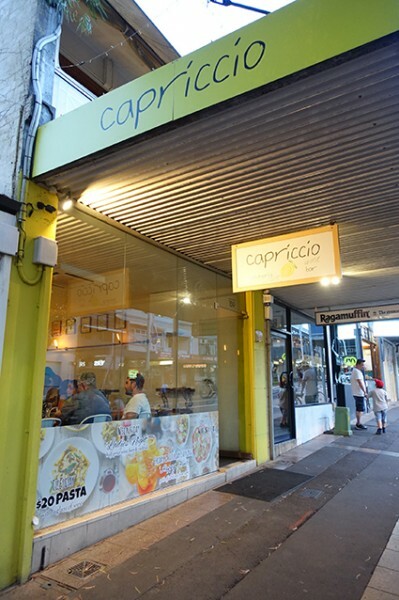 Those doing best, like Capriccio Osteria & Bar, were the spots that offered up al fresco dining options, allowing diners to enjoy the lively flow of people and the balmy night air. A sea of sky-blue clues us in that the Sydney Football Club have done what countless Inner West Council initiatives have not, reviving the ailing dining strip with their A-League post-match overflow from Leichhardt Oval. While they weren’t successful in beating the Central Coast Mariners, a draw keeps the street mood light. 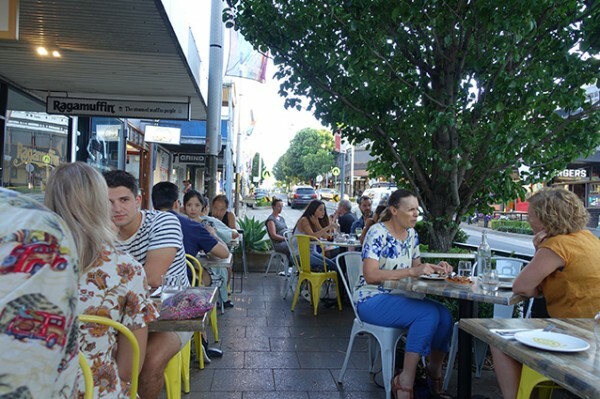 Fresh from a depressing Lebanese movie, Capernaum, at Palace Norton Street, that was centred around a young boy wising up to the reality of intergenerational poverty before he even hit puberty, we sink into outdoor seats and feed off the other diners’ happier vibe. 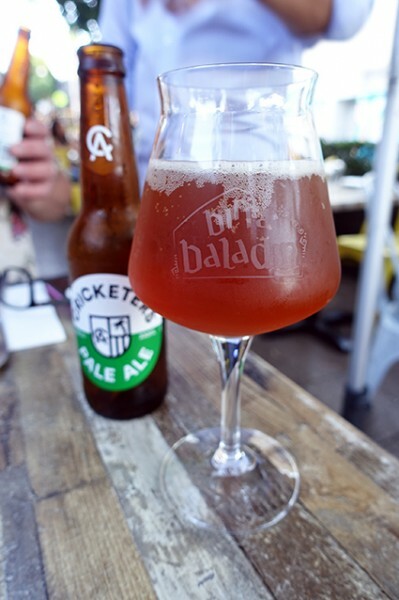 Beer helps too – the Cricketers Pale Ale ($9) from Melbourne – a food beer that has a hint of citrus from being late hopped with Amarillo, and robust caramel from the use of three different malts. 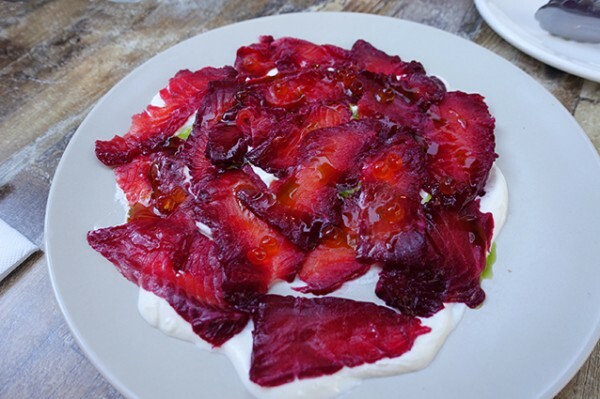 It’s just the ticket with chef Nicole Bampton’s eye-catching Cured Ocean Trout ($26), where beetroot and vodka cured fish sits on a creamy bed of goat’s curd. Gleaming orange pearls of smoked salmon roe kick up the robust flavour of this deceptively pretty dish even further. 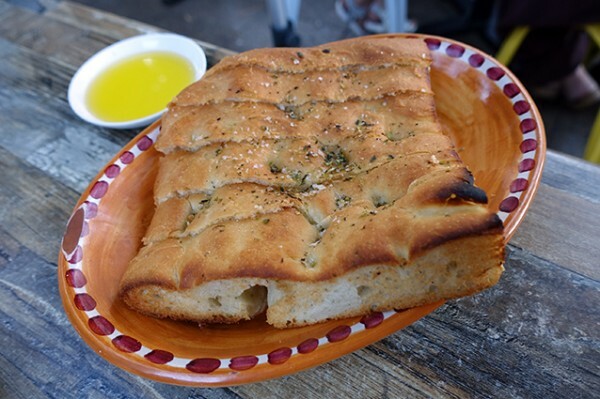 It’s the kind of carpaccio that works best when punctuated with House-Made Rosemary and Sea Salt Focaccia ($5) plucked straight from the wood-fire oven. And being the kind of evening that calls for a grazing style meal, we give the wood-fire oven a workout with a series of small dishes. 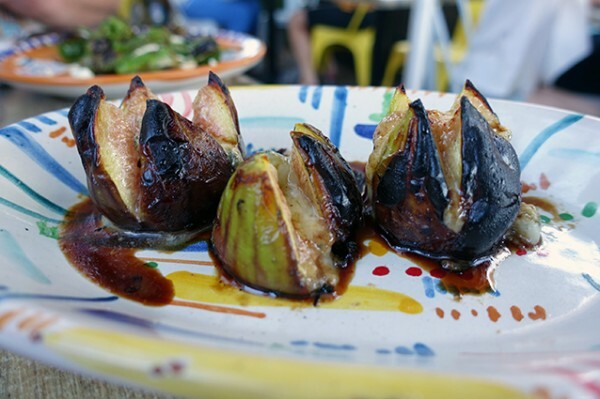 Wood-Fired Figs ($16) arrive as a trio, lewdly split open like fictitious triffid flowers. Their pink innards have been exposed for the generous application of oozing Gorgonzola cheese, with a splash of vincotto before serving. 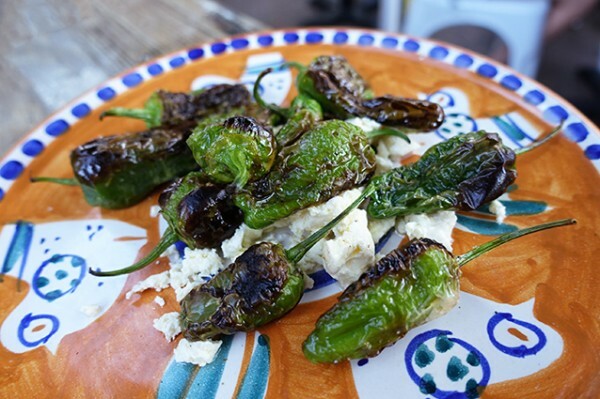 Equally good are Padron Peppers ($21) left to blister in the oven, before being served on a bed of Persian feta cheese. Grown in flood-ravaged Queensland, these are all mild versions of the famous Spanish green peppers that can sometimes surprise with intense heat. They have a very short season, so you’ll have to hurry in if you’d like to enjoy them here. 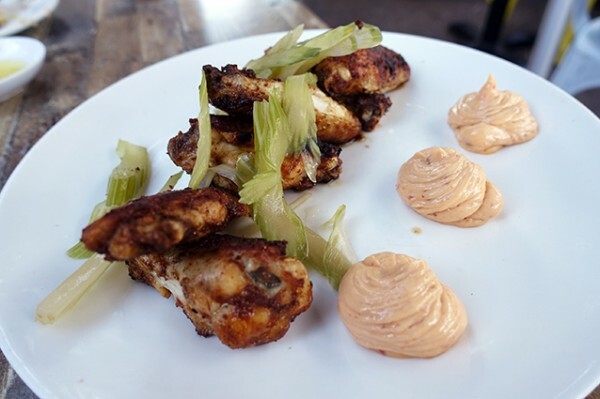 Generous whirls of ‘nduja mayonnaise make eating Wood-Fired Chicken Wings ($16) lively and exciting. They’re served with sweet pickled celery to balance the spreadable salami's spicy burn. Pasta is always a particular highlight at Capriccio. The small kitchen team makes most of their ever-changing pasta range by hand, including measuring and cutting pappardelle five sheets at a time. 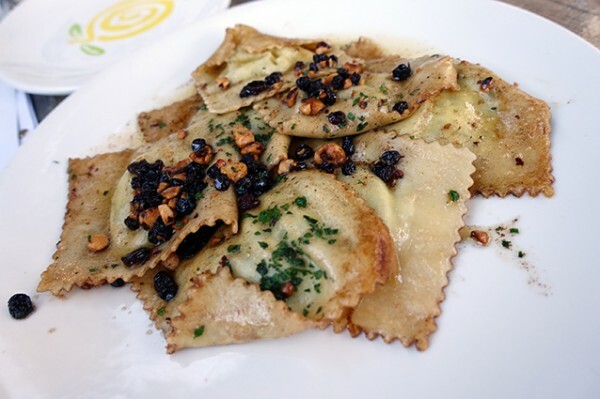 While Ravioli ($29), like the puffy pillows filled with chalky ricotta and spinach then served with simple brown butter, hazelnut and currant, are a bit of a staple, corzetti had me scratching my head. 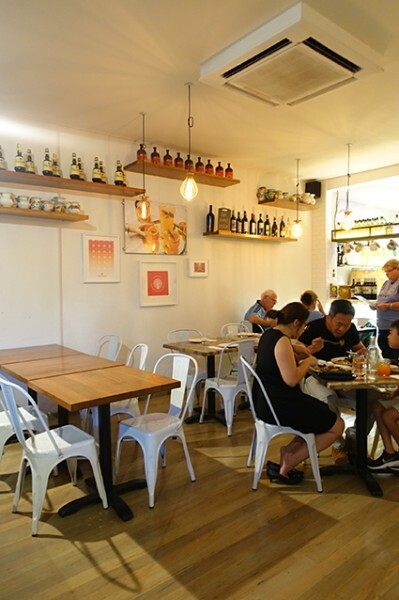 Luckily charming owner Michele Rispol is generous with his time on the floor, and happy to offer up an explanation of this less-than-common (in Sydney at least) Ligurian pasta. 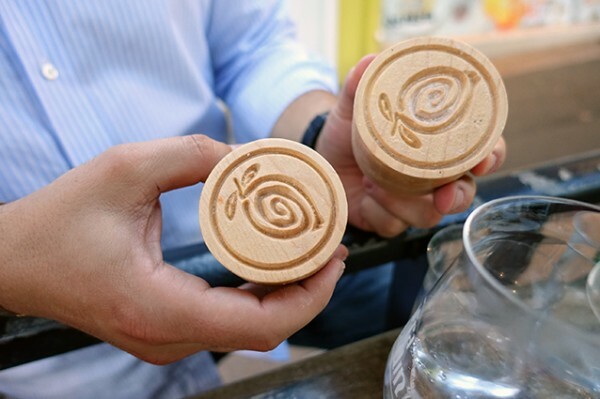 It’s made by hand-stamping circlets of pasta cut from long sheets. As the pasta has to be quite soft to take the stamp (hand-made for the restaurant in Italy) it then has to dry, meaning they’re making their labour intensive Tomato Corzetti ($30) a day ahead of you eating them. 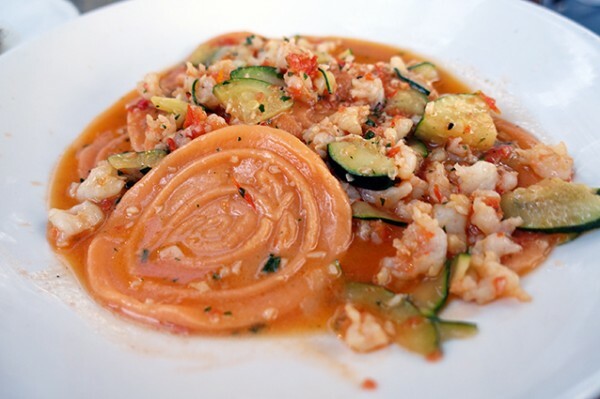 Served with a bisque-like sauce made with banana prawns, cherry tomatoes and zucchini, these silky corzetti are the highlight of my meal, with the circles in Capriccio's spiral logo helping to make the light sauce stick. 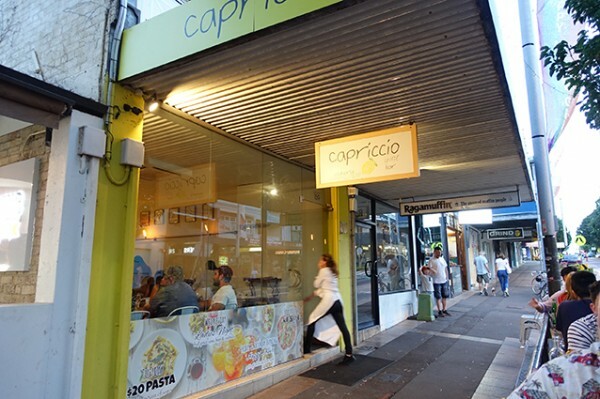 If, like me, you like learning more about Italian food and culture, Capriccio Osteria & Bar are having their next regional feast on Thursday night. The theme for this one in Venice Carnivale, so you can wear a mask or costume if you like, and be in the running for a $150 cash prize. This would effectively make your dinner for two people free, as the 5-course meal that includes booze is $75/head. Michele tells me there are still a few seats left, but you'd have to book in by Thursday morning to attend. NOTE: You can see a previous feast at this restaurant back HERE.